I trimmed 100lb white card stock to an A6 size card (6 1/4″ x 4 1/2″) and the second layer (6″ x 4 1/4″) in ECD’s Soft-finish 100lb card stock. 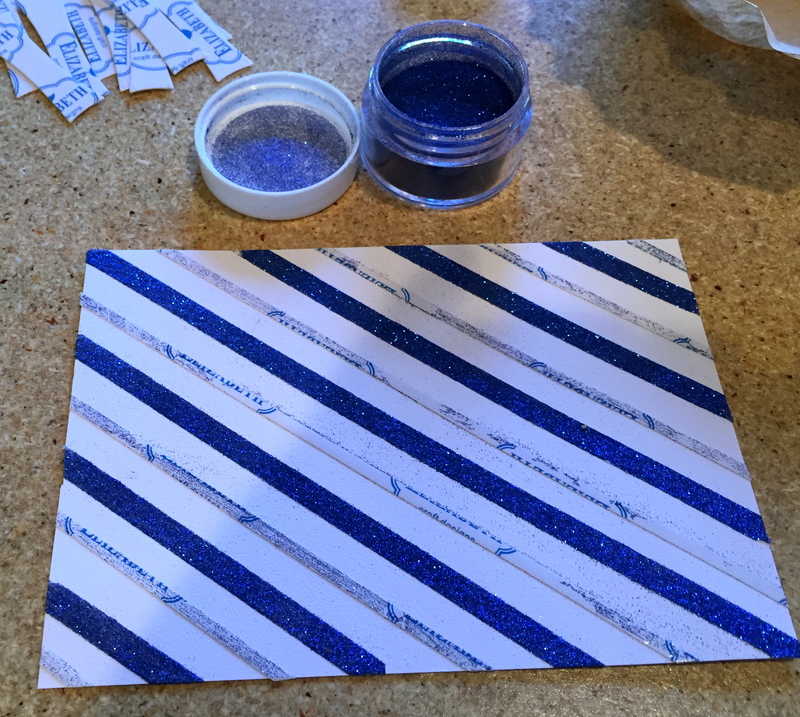 I created a diagonal pattern using ECD’s 6mm & 3mm clear double-sided tape, then I applied Silk Microfine Glitter in Royal Blue (#623) on the 6mm strips and Silver (#603) on the 3mm strips. 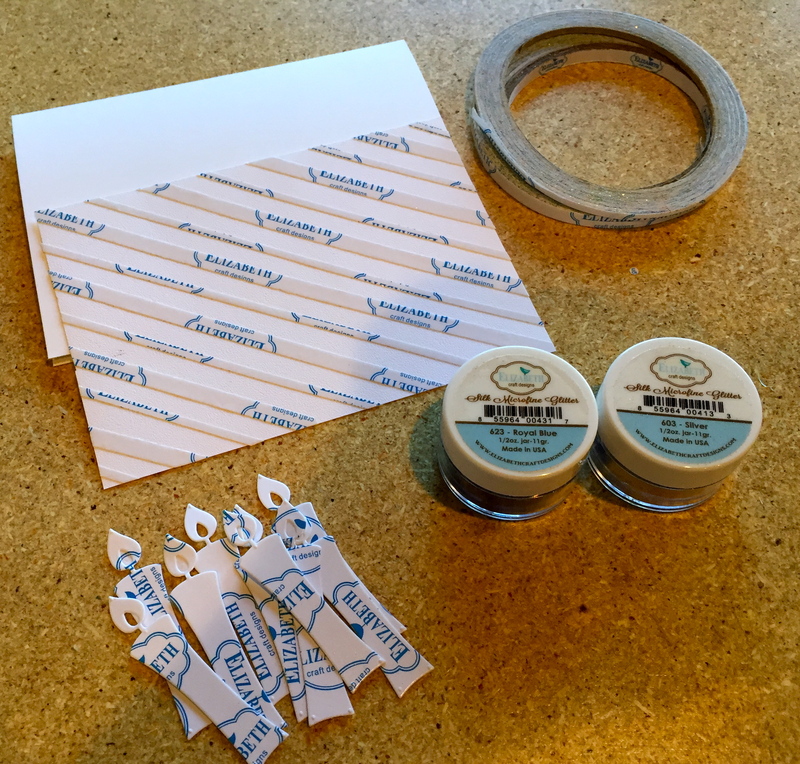 Assemble card and add Peel Offs (#1016) in Silver around the edges. 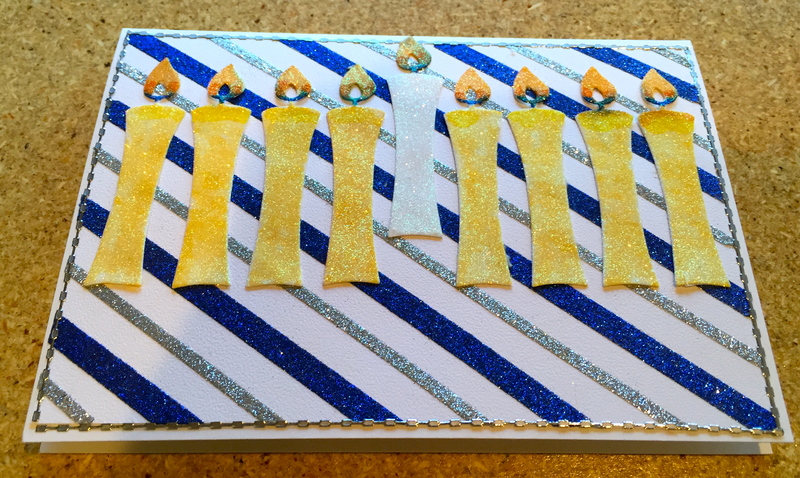 I die cut the 9 candles, using just the plain candle, with ECD’s Clear Double-Sided Adhesive on top of the 85lb Soft-finish card stock so I could hand color them after applying Silk Microfine Glitter in Warm Diamond (#640). I used Beacon’s Kid’s Choice glue to adhere them to the top of my card. I die cut Garden Notes Poinsettia (#1090) in 85lb Soft-finish card stock, coloring the bottom leaves with Copic Markers in G99, YG97, and YG95. The remaining leaves were left white, except I shaded the stem end with PanPastel Set 2 Bright Yellow Green Shade. Next, I applied VersaMark on all the leaves and embossed with the Super Fine Detail embossing powder. Once they were set, I add stem lines, using my Leaf Tool on the wrong-side of the leaf, then, bend it up on the right side and applied the PanPastel shade to it. Finally, I add vein lines. Assemble the Poinsettia directly on the card below the candles. To complete the base of the “menorah,” I used my White Pine Boughs (#1091) die cut in 85lb Soft-Finish card stock and hand colored with Copic Markers G28, G85, and YG95. These boughs were also embossed as above. I added a few Flourishes (&Branches #1034) die cut in a silver metallic origami paper and set in place under the pine boughs. Gorgeous card! I love the dimension of the poinsettia and the pine boughs! Pretty colors too! This is really a pretty card. I’ll bet it’s even more stunning in person. 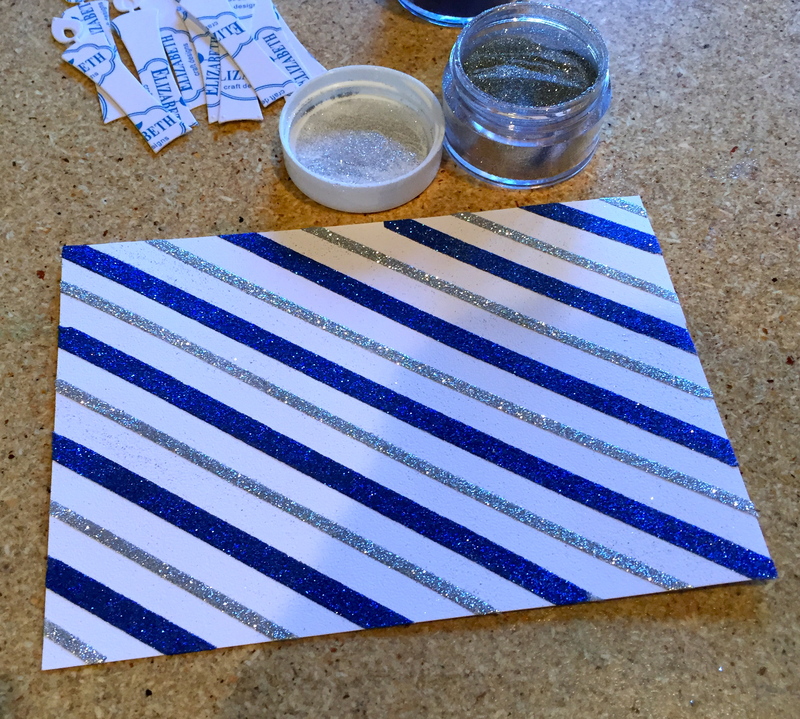 I’ve found pictures don’t show glitter or metallic very well. Oh, really lovely colors and design Susan.